Contact Davies Auto Care Inc. for?Auto Air Conditioning Service in Morongo Valley,?Auto Mechanic in Morongo Valley,?Auto Repair in Morongo Valley,?Auto Repair Shops in Morongo Valley,?Brake Repair in Morongo Valley,?Brake Service in Morongo Valley,?Brakes in Morongo Valley,?California Smog Check in Morongo Valley,?Car Repair in Morongo Valley,?Car Service in Morongo Valley,?Check Engine Light in Morongo Valley,?Mechanic in Morongo Valley,?Oil Change in Morongo Valley,?Smog Certification in Morongo Valley,?Smog Check in Morongo Valley,?Smog Check Stations in Morongo Valley,?Tire Repair in Morongo Valley,?Tire Shops in Morongo Valley,?Transmission in Morongo Valley,?Transmission Repair in Morongo Valley, and in surrounding areas. Morongo Valley is a census-designated place (CDP) in San Bernardino County, California, United States. The population was 3,552 at the 2010 census, up from 1,929 at the 2000 census. Morongo Valley lies along the western edge of the Mojave Desert and near the northern edge of the Coachella Valley, and as such is generally dry. Monsoonal moisture leads to thunderstorms at times during the summer, but in the winter, Pacific storms bring most of the rain. Morongo Valley is unincorporated and is under the jurisdiction of San Bernardino County; it lies immediately north of the Riverside County line. 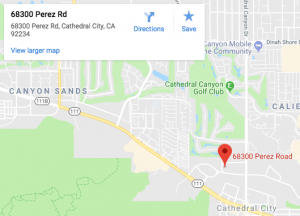 The main commercial development of Morongo Valley lies along Highway 62 approximately 10 miles/16 kilometers north of Interstate 10 and is the first San Bernardino County town travelers encounter when driving north from the Coachella Valley. A popular destination in Morongo Valley is the Big Morongo Canyon Preserve, where one can take hikes, go bird-watching or stroll along the walkways. The governing body of Morongo Valley is the Community Services District (CSD), which has five board members. The only school in Morongo Valley is Morongo Valley Elementary School (MVES), which is part of the Morongo Valley Unified School District. MVES has an enrollment of a few hundred students. The 2010 United States Census reported that Morongo Valley had a population of 3,552. The population density was 140.8 people per square mile (54.4-square-kilometers). The racial makeup of Morongo Valley was 3,076 (86.6%) White, 40 (1.1%) African American, 73 (2.1%) Native American, 31 (0.9%) Asian, 4 (0.1%) Pacific Islander, 187 (5.3%) from other races, and 141 (4.0%) from two or more races. Hispanic or Latino of any race were 531 persons (14.9%). In June 2005, a fire started on Paradise Avenue in western Morongo Valley. This fire quickly spread, torching about six thousand acres (24-square-kilometers). Luckily, only seven homes were burned. The fire also damaged some of the walkways in the Big Morongo Canyon Preserve, but all damage has been repaired and the entire preserve is once again open for birding and hiking. In July 2006, a fire started by dry lightning in Yucca Valley was almost 100 percent contained, however due to extremely low humidity, high temperatures, and 40 mile per hour gusts, the fire grew. The fire quickly spread from Yucca Valley through Pioneertown and Big Morongo. In fact, another small fire dubbed the Millard Complex fire merged with the Sawtooth Complex fire. Well over a hundred structures were burned in the two fires. Virtually no damage occurred in Morongo Valley itself.